And, of course, women enjoy going out with men, too. But if there’s nobody available to attend an event or take part in an activity, many women skip it and stay at home. Brave women, however, go out and have interesting experiences alone! Life’s short, and there are millions of fun things to do and exciting places to see. If you wait for someone to go with you all the time, you miss out on a lot — activities, travel, events and adventure. Many of them are once-in-a-lifetime opportunities. Years ago, I began taking cruise vacations alone. The first one was a little difficult because I’d just broken up with the boyfriend who was scheduled to travel with me, but after that, it was “smooth sailing” and very, very enjoyable and relaxing. What’s not to like about getting to do whatever you want for a week, reading lots of books, going on shore excursions and lying around the pool? I’ve taken about 10 solo cruises since then and loved every one. I do take cruises sometimes with friends, too, and they’re great fun — but traveling alone isn’t a deal-breaker. I’m willing to eat alone in a restaurant anytime; it sure beats cooking. The trick is to bring a book! Sometimes it’s ideal to try new fitness adventures alone or with a group of people you don’t know — especially if you’re not so hot at what you’re trying to do. No eyewitnesses to tell tales! In the last few years, I discovered a number of my friends — even the married women — don’t hesitate to go to the movies alone — especially to chick flicks. So I do sometimes, too (no need to wait til the show comes out on Netflix). If you feel uncomfortable the first few times you do it, sit next to a group of people. Who knows you’re not with them? Instead of worrying that people will think you’re pathetic going places alone, look at it this way. Most people respect women who are brave enough to go for the gusto and do the things they want to do. Being self-assured enough to venture out and take part in life on your own terms is a powerful message to send to your children or grandchildren, as well as your friends. Hopefully, they’ll follow your example and have fun with other people as well as on their own. Don’t let good times pass you by! Get out there and live life to its fullest — and you’ll always have an interesting story to tell your friends and family. 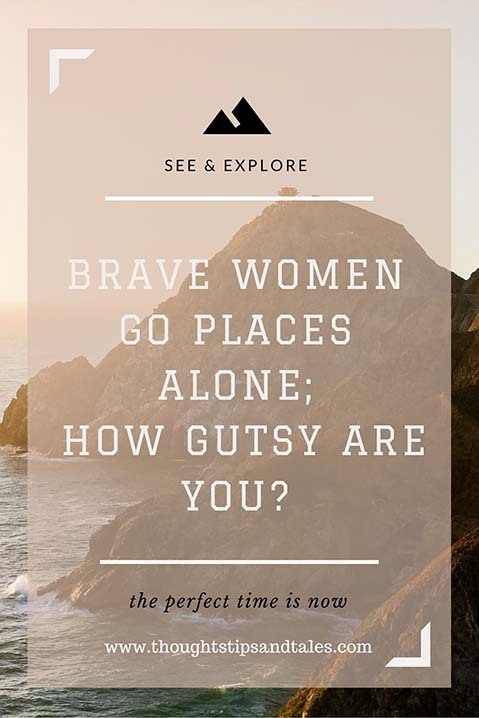 This entry was posted in fun, How to, life, miscellaneous, women go places alone and tagged brave women, solo adventures, solo travel, traveling alone, women go places alone. Bookmark the permalink.